Is it a bird? Is it a plane? No - and nor is it Superman, although it's not a million miles away. Here, the crime-fighters in question are the police of Dubai, on their new propeller-powered flying motorcycles. Police say the hoverbikes will help them 'fight crime in the skies' - no, not seagulls up to mischief, but incidents occurring in hard-to-reach areas. Footage has emerged of police clad in protective gear taking off on the S3 2019 hoverbike for their flying lessons over a football pitch - with the Dubai skyline visible in the background, it looks like something out of a futuristic sci-fi movie. The flying bikes were designed by a California tech firm called Hoversurf, and were presented to the Dubai officials at GITEX - the annual technology trade fair in Dubai. The firm has offered to provide authorities with over 30 of the flying contraptions, stating the emirate's law enforcement has the exclusive right to order as many as needed - if you're gutted and fancy getting your hands on your own hoverbike (let's be honest, who doesn't want that?) the firm will also be allowing the public to buy one - if they are screened to establish safe use. However, buying just one of the bikes will set you back a staggering $150,000 (£114,000) - so not the cheapest investment. As exciting as they seem, the bikes are effectively giant drones you can ride - actually, that is pretty cool. They are 253lbs battery-powered machines with the ability to fly for up to 40 minutes, going 60mph and can get 16 feet in the air, all before needing recharged. The Hoversurf website states: "By combining our custom-built flight controller, the most innovative composite material processes and having a dedicated team we were able to achieve something truly amazing. "We presented the S3 2019 to the Dubai Police at this years GITEX 2018 where it will now be integrated into their fleet of futuristic vehicles. "Both Hoversurf and Dubai Police understand that this is just the beginning to something much larger. "A partnership where both see the future is within our grasp and that together we can materialise the human dream of personal flight." 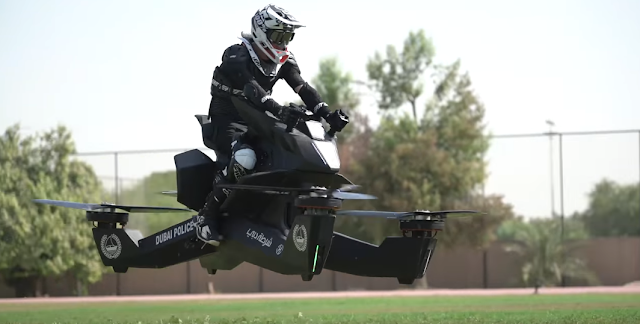 Police in Dubai hope to have the hoverbikes rolled out to use in action by 2020 - so the police have just over a year to perfect their RoboCop-style moves. Brigadier Khalid Nasser Alrazooqi, general director of Dubai Police's artificial intelligence department told CNN: "Currently we have two crews already training (to pilot the hoverbike) and we're increasing the number."